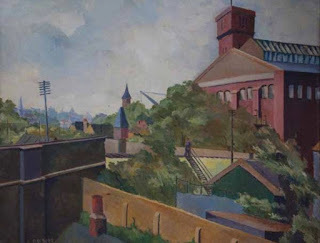 I'm sure that most if not all of the History Girls and our readers know of the brilliant blog http://spitalfieldslife.com/ If you're not a regular visitor, then do go and spend some time there and you'll discover lovingly written and richly illustrated stories of life in London, particularly the East End. There's a grim but fascinating post on The Hackney Whipping Post, once thought a suitable subject for postcards, now rotting away in a backlot, as just one example from May. I got my copy from the marvellously eccentric bag and packaging emporium Gardeners on Commercial Street, but you can buy copies direct from the blog. 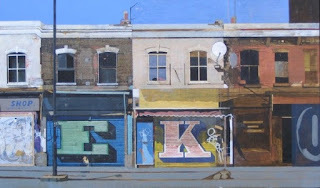 Anyone with an interest in art or the East End should get one immediately. And another for a friend. 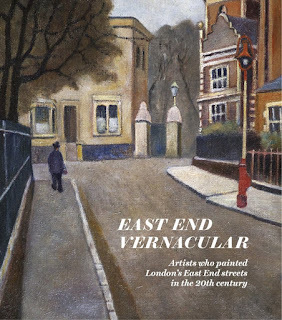 It's a very handsome, beautifully produced volume which chronicles the artists who have caught the East End on canvas over the last hundred years or so and is a rich sampling of a huge range of work. The Gentle Author takes pains to gather the testimony of the artists themselves which makes for a fascinating, intimate read and an inspiring glimpse into their lives. The images are reproduced with enormous care and if they share anything other than geography it's a sort of intimacy and particularity which makes them, I think, universal in their appeal. Taken as a whole the book offers a fascinating way to look at the range of styles of art created in paint and pencil in the 20th century as well as a portrait of a shifting urban landscape. I found something particularly fascinating about some of the later images such as those of James MacKinnon and Marc Gooderham who incorporate the street art of the area into their work in the same way earlier artist such as James Boswell used signage and advertising. The book celebrates the work of a healthy number of women artists too, such as Rose Henriques, Grace Oscroft and Pearl Binder and reflects on the particular challenges they faced in their work with clear-eyed empathy. But please, don't just read the extracts linked to above - get the book. It's delicious and inspiring brainfood and that's always worth paying for.